Live From Holland America Line: Is Koningsdam a Good Ship for Families? Holland America Line and families aren't two words you would necessarily associate with each other. The line is better known for attracting and appealing to seniors, with few or no facilities for families. Last year, however, the line launched the 2,650-passenger Koningsdam, its biggest ship yet, with a host of features firmly aimed at the family market. But do those features work? And does the ship appeal to families? 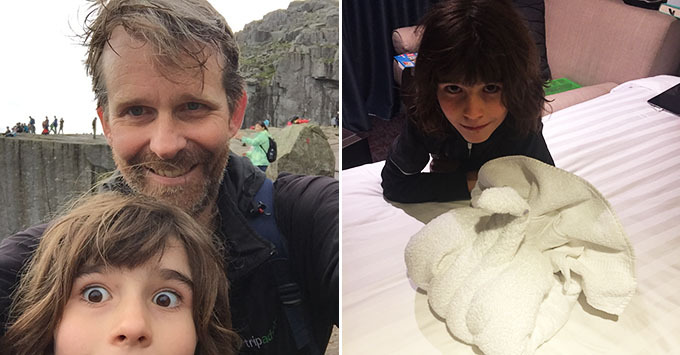 I'm onboard with my 10-year-old son Findlay (and 300 other kids), at the start of summer vacation on a seven-night Norwegian fjords cruise, to find out. 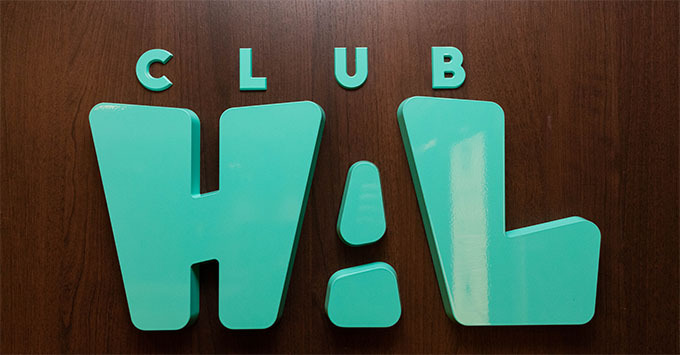 Club HAL is the ship's kids' club, perched atop the ship on Deck 10, with three separate rooms: one for teens, one for "tweens" (7-12-year-olds) and one for the youngsters (3-6-year-olds). There is lots of natural light, an outdoor play area and easy access to the sports court above. Though this space can't compete in size compared, say, to a Royal Caribbean ship, it has a lot of stuff to do, and never felt crowded. In the tweens room, you'll find: air hockey, foosball, La-Z-Boy cushions, Xbox 360, several TV screens, board games, books, coloring tables and jenga. There are also plenty of organized activities which take place throughout the day, and the counselors will even take the children to lunch for you. You can also leave them onboard the ship, while you go out an explore. The only downside is the three-hour gap from 4 p.m. to 7 p.m. when the Club is closed. It seemed a long and odd time to close, when most other kids' clubs onboard ships are open continuously. However, this doesn't matter when, in my son's words: "Club HAL is massive, there are loads of things to do, all the kids are friendly and the staff are very nice and helpful." Anyone doubtful about whether kids are catered for on this ship should head to the main Lido Deck pool at about 4 p.m., or all day on a sea day. There are three hot tubs, all full of children; kids are dive-bombing into the main pool, playing games or slurping ice-creams at the side. Adults look on, most of them parents or grandparents, keeping a watchful but uncritical eye. Maybe it's the nationalities onboard (the Dutch -- the majority on this sailing -- are a pretty relaxed bunch), or perhaps the time of day, but there do not seem to be any obvious complaints about the noise level or fooling about. I've been on ships when there have been almost continuous grumbling and complaints; it's lovely to sense such a relaxed atmosphere. As Findlay says: "It has a very warm, large swimming pool and I love sitting in the hot tubs." A kids' menu available at every meal, even in the specialty restaurants. You'll find outstanding build-your-own pizzas at the New York Deli & Pizza, burgers from the Dive In pool bar, a live cooking station dedicated to Far Eastern cuisine, including noodles, stir fry and rice; popcorn and hot chocolate by the pool on movie nights; free ice cream, with sprinkles. No doubt you can find all these food options in various different guises on many ships around the world, but here on Koningsdam the combination of all these options works perfectly when you're traveling with children of a certain age. Also new to this ship are poolside movies. Besides screening popular children's films such as Boss Baby in mid-afternoon, the screen is also used for showing stunning wildlife documentaries, thanks to HAL's partnership with BBC Earth. It's ideal for keeping the kids entertained. Koningsdam plies the Norwegian fjords round trip from Amsterdam, calling at Oslo, Kristiansand, Stavanger and Flam. At first blush, this itinerary might not seem to be ideal for a family, compared to the Mediterranean or the Caribbean, with their obvious draws of beaches, warm seas and sunshine. After a few days here, however, you realize that the fjords have a magic and a beauty that captures even the most jaded, screen-addicted child. I've spotted Findlay staring transfixed at the forests, waterfalls and tiny painted villages we've passed by these past few days. He even (unprompted) chose to set up a tripod on the balcony to take pictures, rather than play an extra hour of Minecraft. 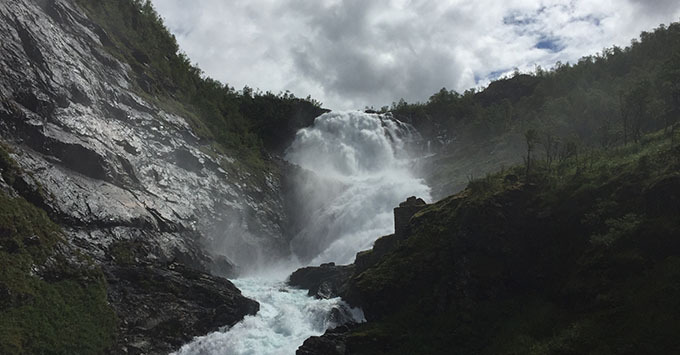 He's also loved the shore excursions: gentle boat rides through the stunning archipelagoes and harbors that dot this coastline; the famous Flam Railway, the steepest in Europe, which passes by waterfalls, sheer cliffs and switchback roads; and Pulpit Rock. The latter is reached via a steep and challenging two-hour hike up steps, rocks, and boulders and through streams, often in rain and mists. Although on paper that might sound completely unsuitable for a child to tackle, it's not. It's doable with even the youngest kids in tow -- or in my case out front and out-pacing me – as the route, which includes wooden walkways and plenty of flat sections, allows time to catch your breath and press on. Just take plenty of water and snacks. When you do reach the top, the sense of achievement is hard to put into words. A few acts of thoughtfulness really stood out. Findlay joined us adults at the ship's poshest specialty restaurant -- the Pinnacle Grill -- for dinner one evening. He's not a fussy eater, but he's not a big fan of steak or lobster (the two main choices), and I was concerned we may have to order from elsewhere. But we had barely sat down when a waiter presented us with a kids' menu, which had his two favorite dishes: chicken noodle soup and a cheeseburger. As we adults busied ourselves ordering wine, the sommelier George, engaged Findlay in a conversation about what mocktail he might like, and came back a few minutes later with a daiquiri which Findlay described as "the best milkshake I have ever had". On our second morning, I ordered room service: coffee for one, and warm milk for one. When breakfast arrived, there was an additional sachet of hot chocolate, which I can't recall ordering. I like to think that the room service steward added it unprompted after earlier seeing Findlay asleep in the bed beside me. When I cruised on Koningsdam last year, I can't recall any towel animals in my cabin. On this trip, we've had a different one every night, much to Findlay's (and my) delight. Getting back to the questions posed at the start. Does Koningsdam have family features that work? And overall, has HAL changed its image with a ship that appeals to families? Judging by the smiles on Findlay's face, I'd say it does.